The holidays came early for Vietnam War veteran Raymond Eiseles who is able to celebrate both Thanksgiving and Christmas in his new home after being chronically homeless. 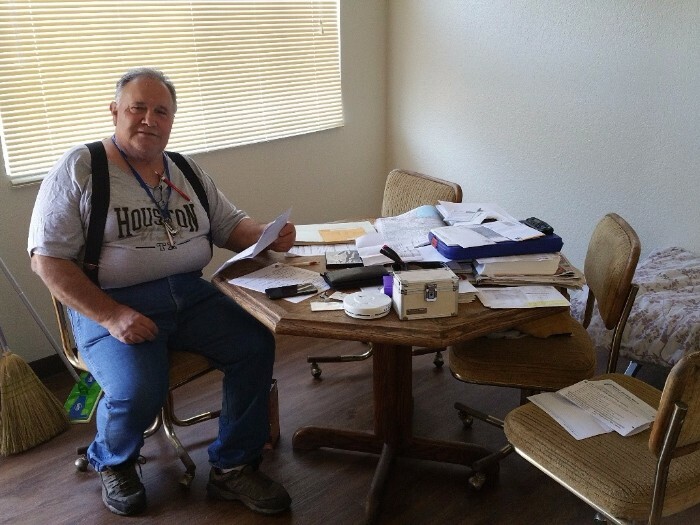 Although Raymond qualified for housing at Peoples’ Self-Help Housing’s (PSHH) Sea Breeze Apartments in Los Osos, CA with his Veterans Administration Supportive Housing (VASH) voucher, he had no furniture or food and only a few clothes, a common dilemma those transitioning from homelessness to permanent housing face. Through PSHH’s Resident Assistance Fund, Raymond received a $200 food gift card to sustain him while he waited for his disability income. The fund is one of many options available for generous supporters to specify for their monetary donations. The fund is designated specifically for PSHH residents facing medical, food and utility emergencies. Then with the assistance of a PSHH social worker, the Army veteran was connected with a generous local couple who provided him with some goods including a solid wood table with four chairs. PSHH's Resident Services Department offers support for residents after they've moved in to ensure they are living stable, independent lives. Licensed and trained social workers are assigned to each property to work with onsite managers to help residents in need. Their tasks are wide ranging from filling out forms necessary for public assistance, helping with parenting issues and solving disputes between neighbors. During a recent visit with his social worker, Raymond said that he is thankful for everyone’s support and grateful for the “active stability” that is being provided for him through all of PSHH’s resources. He added that he is also thankful to know that people are there for him in times of need.